There’s been a ‘linear space’ image about the universe and not until the 20th century did people realize the physically four-dimensional space and the cosmology based on relativity theory. After that, can people naturally form a picture of this new world in the mind? 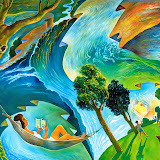 Adopting Chinese great philosophers Zhuang-zi and Hui Shi’s viewpoint of ‘vastness without limit’ combined with the contemporary perspective and the breakthrough on illusion picture, painter Hsin-Tien Su has been devoting his life to creating series of this subject, that is, the new curved and cyclic universe images. But finally, what and how can they be presented? Ancestors in Taiwan believed in ‘Nine Heavens, Nine Earths’, and Wang Chong (Han Dynasty) also proposed the idea ‘the Flat Heaven’, both regarded the heavens and the earths as tectonically flat plates. Wang thought that the plates infinitely extended with heavenly bodies revolving around and moving outward and homeward in long distance. Taiwanese ancestors also considered that the heaven plate began with low rising; one day, a herculean man propped it up with a bamboo pole, making it fly higher and higher as it is today. Thus, take a look at this picture again! The first circle of horizon line the painter drew constructs the first upper formation world, then the overlapped third, fourth ones should be completed if only the second layer could be formed. The red pavilion poles symbolize the sayings ‘Heaven has four columns’ in Chinese ancient myth ‘Shan Hai Jing’. These red large posts draw to a center accompanied by the scarlet heavens and blue skies, emphasizing the reasonable existence for the arch of the skies. And it is obvious that the specialty of the whole transition process of these two worlds attracts the viewers in an illusory way. We can also see the semi- abstract drawing techniques and not so scientific perspective laws used on the colorful and overlapping roads and houses scenery. The double Heaven and Earth is cyclic without any obstructions among it. When universe exists ‘unbounded and yet finite’, then all layers of the worlds inside would mutually surround and interflow, no longer having the endless and unimaginable ‘nihility space’ in people's minds. And, this is precisely the core of this picture.